China has moved past Korea to take the lead in the global shipbuilding market. 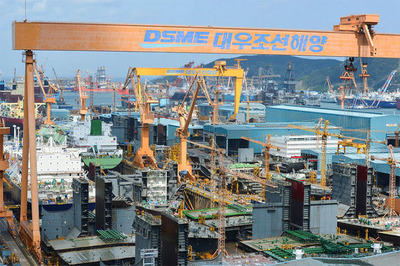 U.K.-based Clarkson Research Services said Monday that Korea accounted for 28 percent or 1.62 million compensated gross tons of global shipbuilding orders in the first quarter of this year. China took the top spot with 45 percent or 2.58 million CGT. Italy was third with 14 percent and Japan fourth with 8 percent. Chinese shipyards benefited from Chinese companies' tendency to favor domestic builders, with 10 new such orders for container vessels of 15,000 TEU. One TEU is equivalent to one 6-m container. Korean shipbuilders were also hit by a decline in orders for LNG tankers, which fell to 13 from 19 in the same period of last year.